Half-birthdays are only necessary when you are born in December or on a regular national holiday. Since I only remember three actual birthday parties complete with friends growing up, my half-birthdays in June have become special days, for me and me alone. Today’s lunch is tacos, which is timely and awesome. 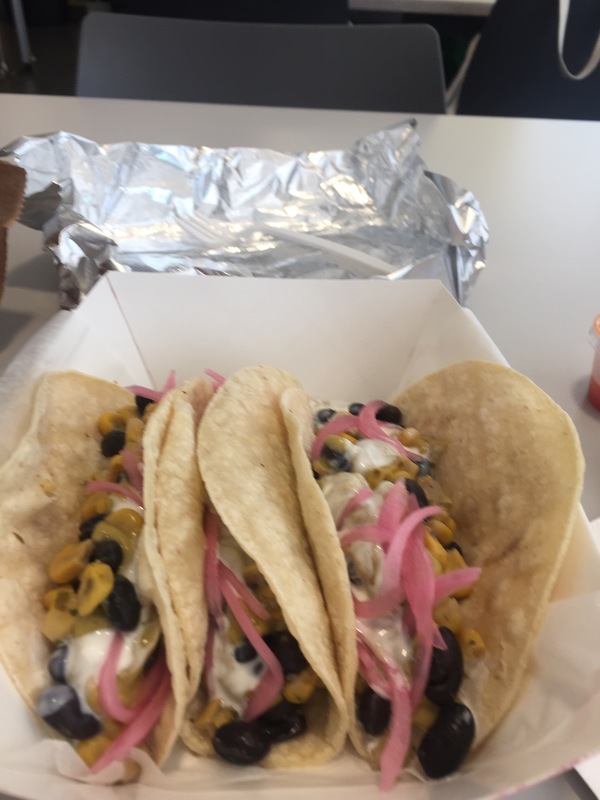 My pick at Don Tapas today was three Veggie Fiesta tacos: black beans, corn, crema (but no cheese), pickled onions, and guacamole special (not really that special, actually…) with hot sauce, on soft corn tortillas. There were two other flavors: Carnitas (pork) and Pollo (chicken), which was unavailable. The Veggie Fiestas were more of a gloop-fest than an actual party in my mouth. I wish the chicken hasn’t run out; the creamy beans and corn kept running out onto the plate. I ended up resorting to a fork after one-and-a-half tacos. Nevertheless, the taste was pleasant enough…it was just OK. I personally think it’s more of a Cali-Tex than a Tex-Mex palate, but the cooks were from Spain.